Mexican food nearly always sounds good to me. I found this recipe while blog-hopping. It's quite easy, and while I baked them, this recipe also works in the crock-pot. I pumped up the veggies in the recipe, because I like to do that. We both enjoyed this new (for us) take on Mexican. 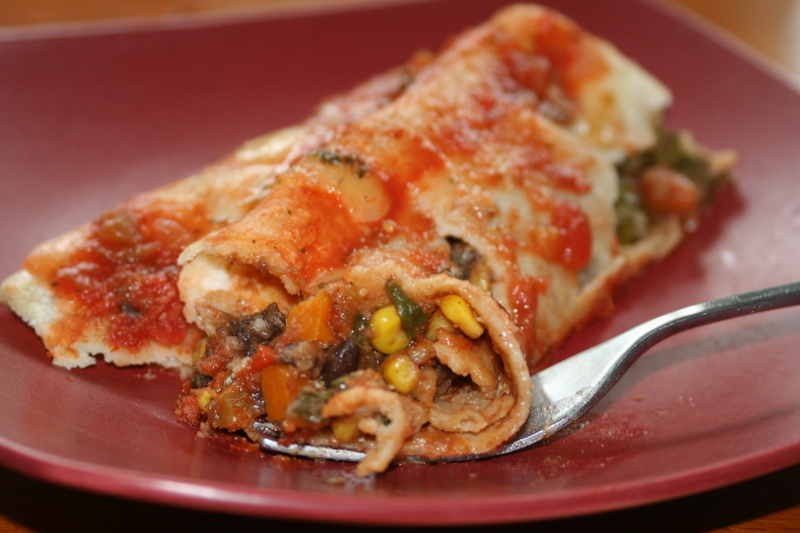 These enchiladas are vegetarian, but you can easily add some leftover cooked meat to the filling. In a medium bowl, mix together the onion, pepper, tomato, spinach, black beans, corn, spices, meat (if using), and 1/2 cup of the cheese. Pour about a cup of salsa (half a jar) into the bottom of the slow cooker and spread it around evenly. Scoop about 1/3 cup filling into one of the tortillas, roll it up, and nestle it into the bottom of the crock pot. Repeat with the half of the remaining filling, rolling tortillas until the entire bottom of of the crock pot is filled. Spread another cup of salsa over this layer and sprinkle it with another 1/2 cup of cheese. Cook's Note: To bake these enchiladas in the oven, layer the rolled tortillas in a 9x13 baking pan and cover with aluminum foil. Bake at 400° for 20 minutes. Uncover, sprinkle with cheese, and bake uncovered for an additional 5-10 minutes. Hi, I Iove the recipe, please keep it up, and keep posting them. I love how you incorporated 1 cup frozen corn. Did you do this to create liquid, and or have you ever thought of adding beer to it? I have a site myself crockpotking.com I have quite a few books & videos & articles re: this kind of cooking, and how it creates a lot of time for people, or people with families that are on the go. But other then that please keep posting awesome recipes like this on. Bravo !! keep it up. Glad you enjoyed this recipe, Ben! In my opinion, the corn is more for flavor and texture than for moisture.